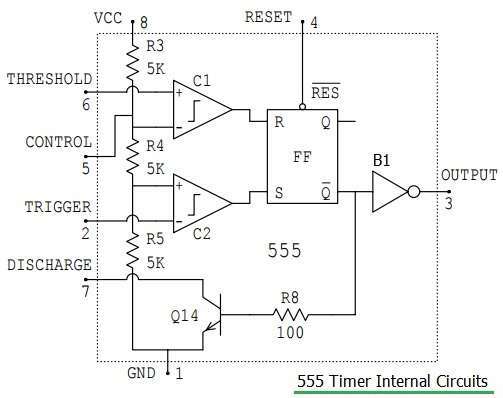 What is 555 Timer IC ? In this lesson, we will introduce the 555 Timer Integrated Circuit (IC). 555 Timer IC is one of the commonly used IC among students and hobbyists. There are a lot of applications of this IC, mostly used as vibrators like, ASTABLE MULTIVIBRATOR, MONOSTABLE MULTIVIBRATOR and BISTABLE MULTIVIBRATOR. You can find here some interesting circuits based on 555 Timer IC and the Osoyoo Uno boards. The 555 timer which gets its name from the three 5kΩ resistors it uses to generate the two comparators reference voltage, is a very cheap, popular and useful precision timing device that can act as either a simple timer to generate single pulses or long time delays, or as a relaxation oscillator producing stabilized waveforms of varying duty cycles from 50 to 100%. We will go over the pinout of the 555 timer. 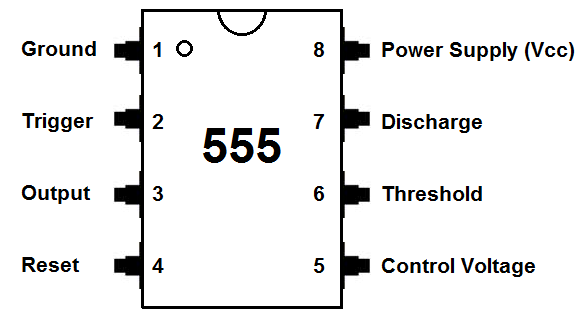 The 555 timer is an 8-pin IC.This means it has 8 different pins, each of which have different functions for the IC. • Pin 1. – Ground, The ground pin connects the 555 timer to the negative (0v) supply rail. • Pin 2. – Trigger, The negative input to comparator No 1. A negative pulse on this pin “sets” the internal Flip-flop when the voltage drops below 1/3Vcc causing the output to switch from a “LOW” to a “HIGH” state. • Pin 3. – Output, The output pin can drive any TTL circuit and is capable of sourcing or sinking up to 200mA of current at an output voltage equal to approximately Vcc – 1.5V so small speakers, LEDs or motors can be connected directly to the output. • Pin 4. 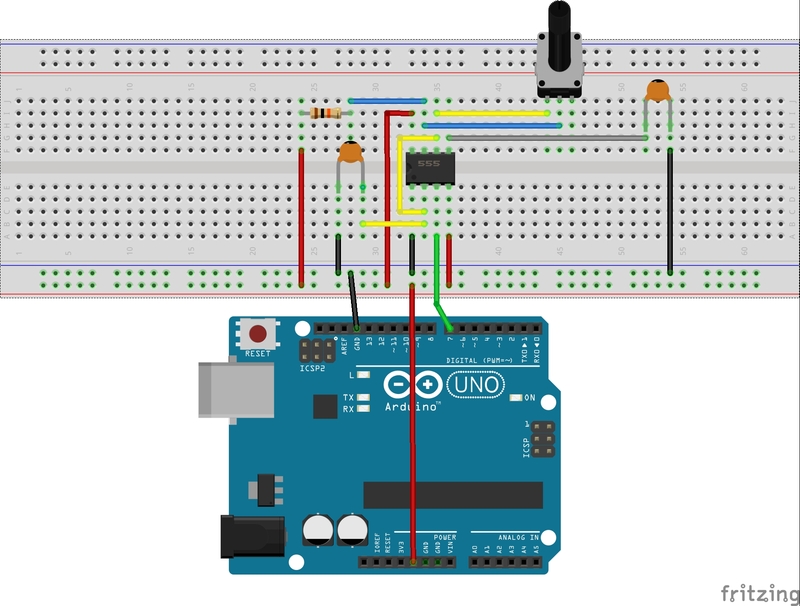 – Reset, This pin is used to “reset” the internal Flip-flop controlling the state of the output, pin 3. This is an active-low input and is generally connected to a logic “1” level when not used to prevent any unwanted resetting of the output. • Pin 5. – Control Voltage, This pin controls the timing of the 555 by overriding the 2/3Vcc level of the voltage divider network. By applying a voltage to this pin the width of the output signal can be varied independently of the RC timing network. When not used it is connected to ground via a 10nF capacitor to eliminate any noise. • Pin 6. – Threshold, The positive input to comparator No 2. This pin is used to reset the Flip-flop when the voltage applied to it exceeds 2/3Vcc causing the output to switch from “HIGH” to “LOW” state. This pin connects directly to the RC timing circuit. • Pin 7. – Discharge, The discharge pin is connected directly to the Collector of an internal NPN transistor which is used to “discharge” the timing capacitor to ground when the output at pin 3 switches “LOW”. • Pin 8. – Supply +Vcc, This is the power supply pin and for general purpose TTL 555 timers is between 4.5V and 15V. IC555 has three different operating modes. These operating modes actually correspond to three different multivibrator configurations. Astable mode – it is also known as self triggering or free running mode. It has no stable state. It has two quasi stable states that automatically changes from one to another. It changes from high to low state and low to high state without any trigger input after pre determine time. This mode is used to generate square wave oscillations, clock pulse, PWM wave etc. Monostable mode – it is also known as single shot mode. It has one stable state and one quasi stable state. It jumps into quasi stable state from stable state when trigger input is applied and comes back to stable state after pre determine time automatically. It is used in generating pulses, time delay etc. Bistable mode – it is also known as flip-flop mode. It has both stable states. Two different trigger inputs are applied to change the state from high to low and low to high. It is used in automatic switching applications, to generate pulse of variable time etc. If you want to get more info about this IC, please check this link. 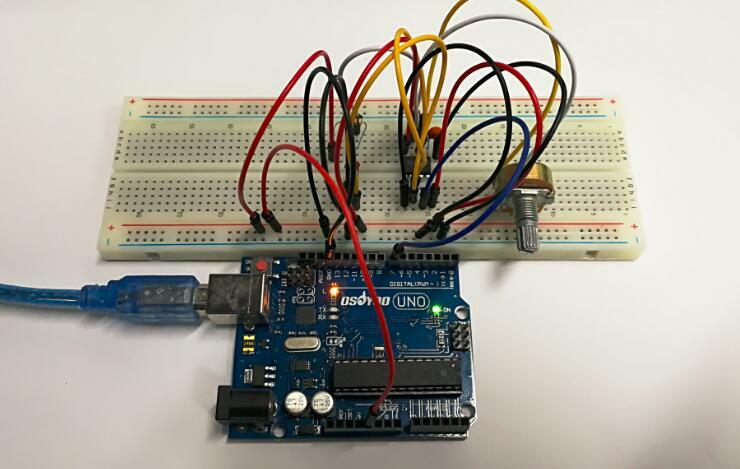 In this example, the Osoyoo Uno board is used to test the frequencies of square waves generated by the 555 oscillating circuit and show them on Serial Monitor. The length of the pulse (in microsecond) displayed will change accordingly.